Today will feature mainly sunny skies in the morning giving way to overcast by this afternoon. Temps will range from freezing along the coast to the low 20’s up in the mountains. Any residual wind gusts from last night are long gone this morning and calm winds are expected to become light out of the S/SW this afternoon as our next system approaches. That system will be in clipper form and will arrive tonight. Expect snow to break out across the mountains late this afternoon arriving along the southern/eastern coastlines by this evening. By the time NYE festivities are well underway at 10 or 11, snow will be falling across the entire area with potentially a few raindrops mixing in along the shorelines south of Portland and the tips of the Midcoast peninsulas. A coastal front will set up tonight near the coast (remember how easy those are to forecast from Thursday night?) and will enhance precipitation along the coast as well as determine who gets rain and who gets snow. At the moment, it looks like everyone will get snow except the shorelines south of Portland and perhaps the midcoast peninsulas. Snow will move out around dawn Sunday. In terms of accumulations, look for a general 1-3″ with two jackpot areas of 3-6″. One of those will be the mountains where upsloping effects will wring out more moisture and the other will be the midcoast away from the immediate shore down to interior Casco Bay/Brunswick where coastal front enhancement will bring more moisture and more lift into the equation. Our next system appears to be a messy/icy one for Tuesday. 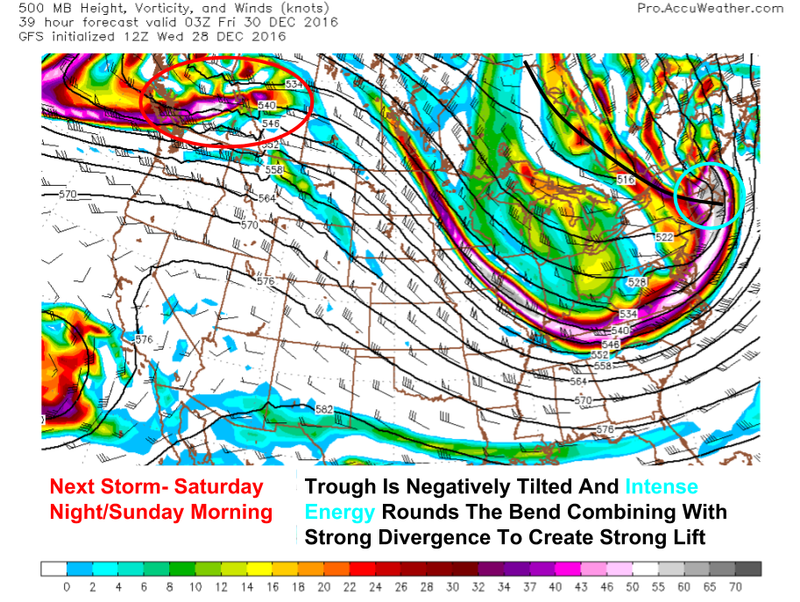 After last night’s explosive storm, we have an active pattern setting up for the next week and possibly beyond. The first storm will be a weak clipper tomorrow night that will bring light snowfall accumulations. The next storm will arrive Tuesday and will feature primarily freezing rain. After that, attention will turn to a potential coastal storm late week. Light snow will begin late tomorrow evening as a clipper approaches from the west. This will be a mainly snow event except for the midcoast where some raindrops are likely to mix in. Snowfall accumulations are likely to range from 1-3″ across most of the area with a little less (coatings) along the immediate midcoast and a little more in the mountains and across the Augusta region where 4 or even 5″ is possible. Snow and rain will move out Sunday morning with temps a few degrees on either side of freezing during the day Sunday. Our next system will arrive from the west on Monday night as high pressure begins digging in to our NE. Look for a brief period of snow at the onset especially away from the coast before freezing rain sets in. The exact duration/extent of the freezing rain is still TBD and those details will determine if we escape with just some minor icing or a more significant ice event. Both options are on the table given the placement of the high and the climatology of the area. More details should make themselves available soon. That storm will move out Tuesday night or Wednesday morning and may end as some snow if a coastal low develops like some guidance indicates. The final storm on the horizon at the moment is one that may impact the region late week. The details on this remain very uncertain as it is 7-8 days away but since it has the potential to be fairly impactful, I figured I’d give the heads up now that there’s something on the horizon. While my schedule will once again become very busy this week with school, I’ll do my best to get updates out on this system should it continue to look impactful. Today’s main weather feature will be gusty westerly winds behind the intense storm that brought feet of snow to many places last night. Wind gusts to 55mph in southern areas and 45-50mph in northern areas are expected. The westerly winds will be able to combine residual moisture from the storm with Lake Ontario moisture to create fairly robust upslope snow bands across the mountains. An additional 3-6″ is possible across the higher terrain with lesser amounts in the valleys. Watch for blowing and drifting snow across the northern half of the region where snow was lighter and fluffier. Power outages will be the main concern in southern areas where snow was heavier and stuck to trees and power lines. Temps today will range from the upper 20’s in the mountains to the mid 30’s along the coast. Ready for more snow? Hopefully the answer is yes as a clipper system is forecast to move through the area tomorrow into tomorrow night. Accumulations are expected to be on the light to moderate side with 2-4″ a solid first estimate for most areas. Locations along the immediate coast could see less as some raindrops may mix in. Our next storm after that is on Tuesday when snow and mixed precipitation are forecast. Our winter storm is panning out mostly in accordance with the forecast with one important exception. The coastal front is a few miles farther SE than forecast which means areas like Portland, Falmouth, Brunswick, Augusta, Waterville, and other towns in that area will get a bit more snow than forecast. The coastal front is also the rain/snow line with warm maritime air, rain, and temps in the 40’s on the SE side and cold air, snow, and temps in the 20’s to low 30’s on the NW side. The coastal front is a few dozen miles SE of its forecast position and the track of the low itself appears to be a bit SE of forecast as well. This means that there is a limited window of opportunity for the coastal front, and thus the rain snow line, to move NW. The wider surface picture shows our storm developing rapidly just offshore with 3 hour pressure falls in excess of 6mb. as the storm explodes just to our east, it will begin to wrap cold air in from the west and the rain/snow line will crash to the coast. As I mentioned in last night’s update and the one on Tuesday night, the precipitation will be coming down very heavily. Radar imagery shows that this heavy precip is developing as the intense upper dynamics begin developing. 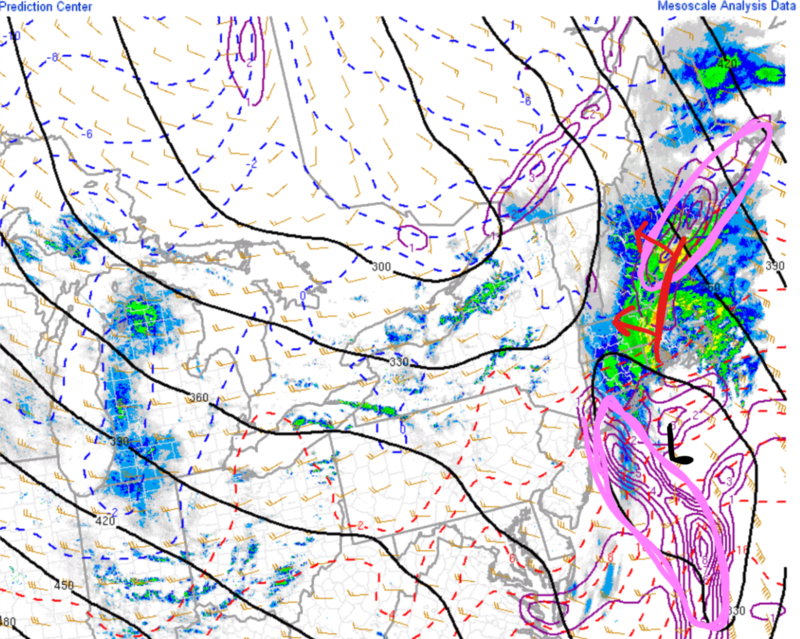 As the warm air offshore collides with the cold air across the interior, not only will the low develop rapidly, but the heavy precip bands will too. The mid level forcing map shows these bands beginning to develop across coastal Maine and southern New England. These bands will continue to intensify this evening as they move slowly NW and in some of the stronger bands, thunder is possible. Snowfall rates of 1-3″/hour are expected in these bands along with whiteout conditions. The heavy precip will dynamically cool the atmosphere so the rain/snow line will be crashing to the coast tonight. For all the detailed analysis, check out the updates I linked to above. The snowfall map still looks good except for the coast where higher amounts are possible due to the lack of NW progress of the coastal front. Strong winds are also still expected with power outages a threat especially for those areas with lots of snow to weigh down trees and power lines. Winds will wind down tomorrow afternoon and evening. We have some exciting weather coming this evening and into tonight as a storm offshore develops explosively. For full details and analysis, check my updates from last night and Tuesday night which detail many of the important dynamics behind the storm. This update will be a quicker/more concise forecast focused mostly on impacts and less on meteorology. 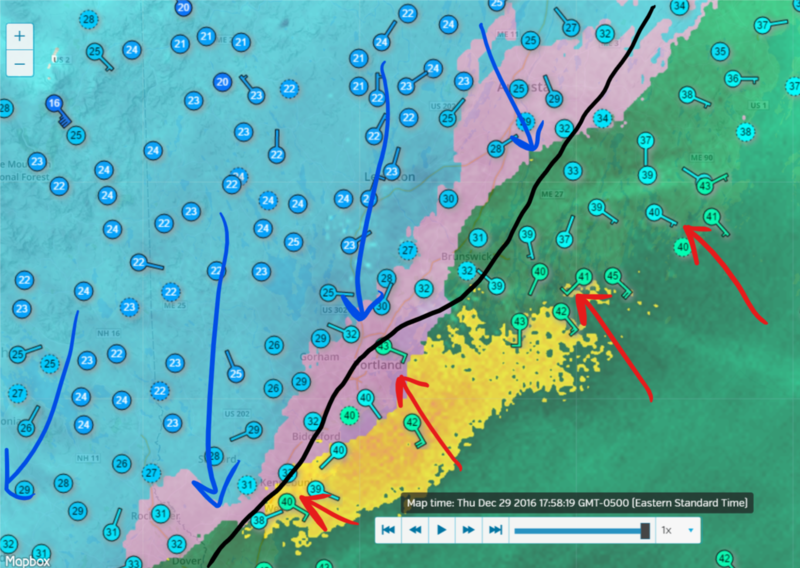 Snow has begun in association with low level convergence along the coastal front. This snow is currently in coastal York and Cumberland counties and will drift north through the morning hours. This snow is light and accumulations, if any, should be under an inch. The main event will begin across the area from SW to NE midday today. Snow will begin with moderate intensity around 10 AM in SW NH and around 1PM in far NE areas. While everyone will likely see some flakes initially, the change to rain will be swift along the midcoast and in York county while interior Casco Bay might see an inch or two before turning rainy. By 3 or 4 PM, our pattern will be locked in with moderate snow inland and moderate rain east of the turnpike. Heavy bands of snow will begin to charge inland after sundown this evening and by 7 or 8 PM, heavy precip will be impacting most of the area. In the mountains, this will mean whiteout conditions as snow falls at 1-3 possibly 4″ inches/hour. Combined with strong winds, expect blizzard conditions even though it may not officially be termed a blizzard. Along the coast, this will mean heavy rain along with gusty winds. Later in the evening, dry air will wrap into the system aloft. While this may decrease the areal extent of the heavy precip by some, it will also trigger instability which means thunderstorms will likely develop and move north during the overnight hours. Thundersnow (!!) is a strong possibility in the foothills and mountains. Wind will be the other big threat. High wind warnings are up for the midcoast where gusts over 60mph are expected. These winds will be on the front side of the low and along the coast SW of Brunswick, these winds will gust in the 50mph range. After the storm makes landfall between Brunswick and Boothbay Harbor, winds will whip around to the west where they will resume gusting over 50mph this time for the entire area. The combination of very strong winds and heavy snow will create blizzard conditions inland for a time later tonight. The strong winds will also likely create power outage concerns especially in areas with 1-2 feet of snow already weighing down trees and power lines. Snow moves out early Friday morning with upslope bands continuing to keep the powder fresh on the slopes. Additional upslope amounts of 3-6″ are possible in the favored areas given strong WNW flow and abundant low level moisture. More (lighter) snow is in the forecast for NYE. A very interesting and exciting ~18 hours is in store from tomorrow evening through early Friday morning. During this time, look for torrential downpours along the coast, whiteout snows inland, and strong gusty winds for all. 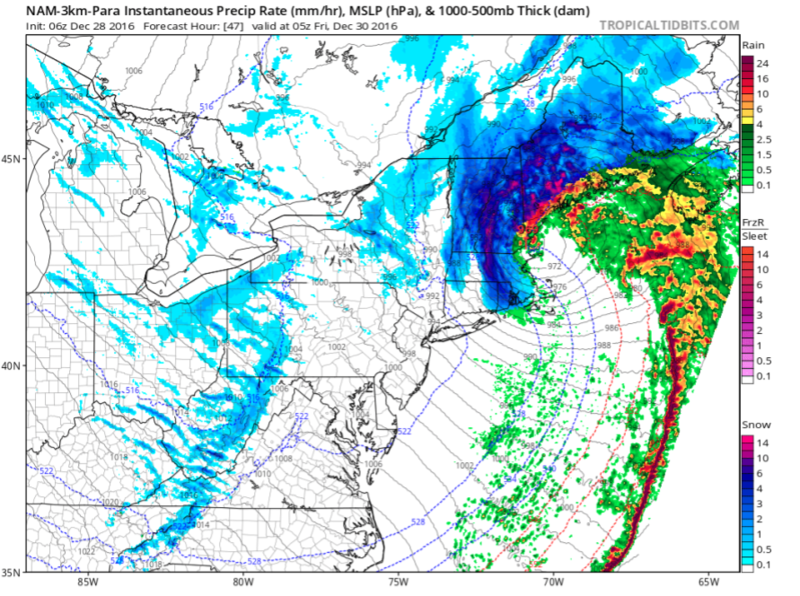 This will be brought to you by a rapidly intensifying coastal storm that will deepen roughly 20mb in 12 hours. This is double the rate of deepening needed for official bombogenesis! Just a quick note before the fun… If you’ve been reading my storm updates for a while, you know I get into some fairly high level (and interesting!) meteorology while outlining what I expect to happen. If you’re new to my blog, this is how I like to operate as I think it gives you the reader a unique look “under the hood” of weather forecasting. 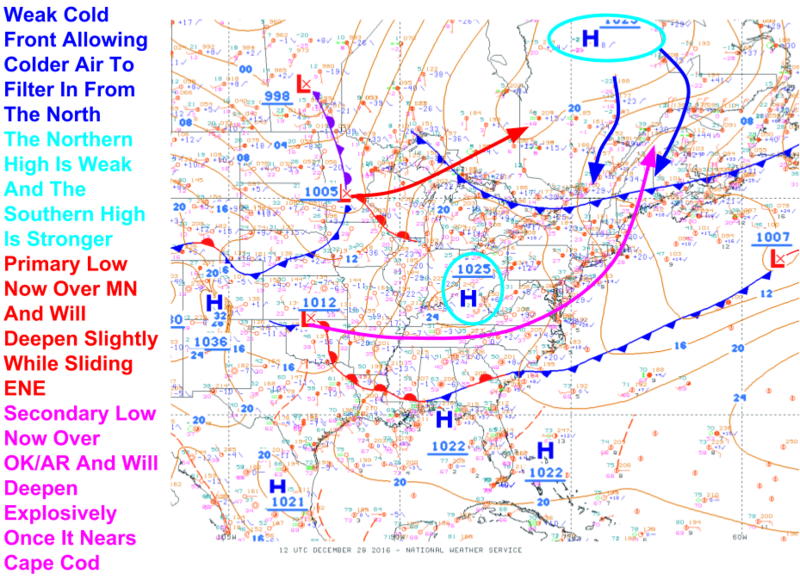 I try to explain technical concepts in an accessible way so you too can become part weather geek. If you’re not into the “why behind the what” or just simply don’t have time to enjoy lots of weather geekery, scroll to the bottom where I’ll put my snowfall map and a concise forecast. Maybe you’ll even see a map interesting enough to read about on the way down! The upper level pattern is relatively zonal today meaning that winds are mostly blowing west to east and there are no significant disruptions in the flow (storms, blocking highs, etc.). This will change to a certain extent in the next 24 hours but it’s important to remember that the overall zonal flow will prevent this storm from sitting and dumping. 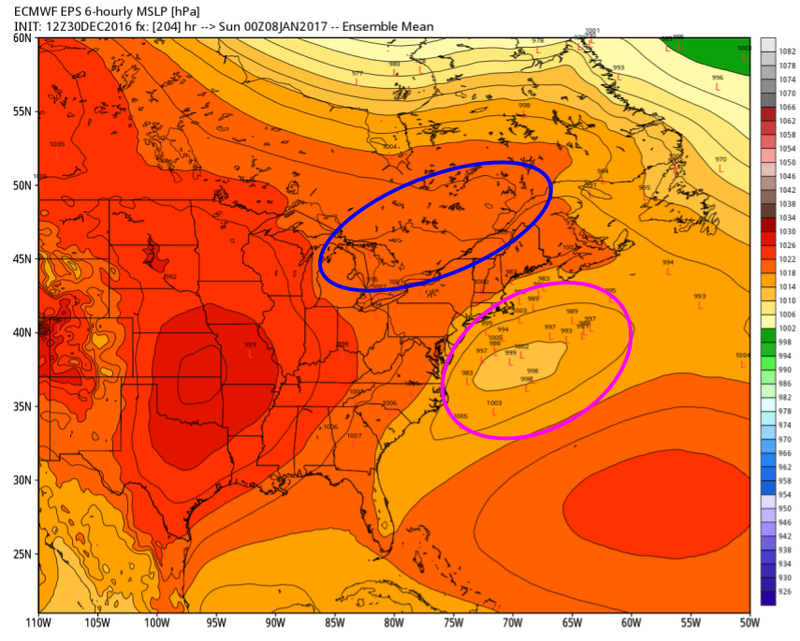 Also notice the lack of any substantial blocking high pressure over NE Canada. The zonal flow and lack of blocking means that this storm will be a fast mover and totals will be limited by the short duration of heavy snow. That doesn’t mean some hefty numbers will be recorded, it just means that this storm probably isn’t one for the record books. At the surface, the setup isn’t quite ideal for a major storm but it does show that heavy snow is likely across the interior. The limiting factor for coastal Maine and New Hampshire will be the lack of deep cold air. This is a function of a) the zonal pattern discussed above, and b) the relatively weak high to the north and the relatively strong high to the south. This means the high to the south will be the primary driver of a) the flow ahead of the storm and b) the antecedent airmass. 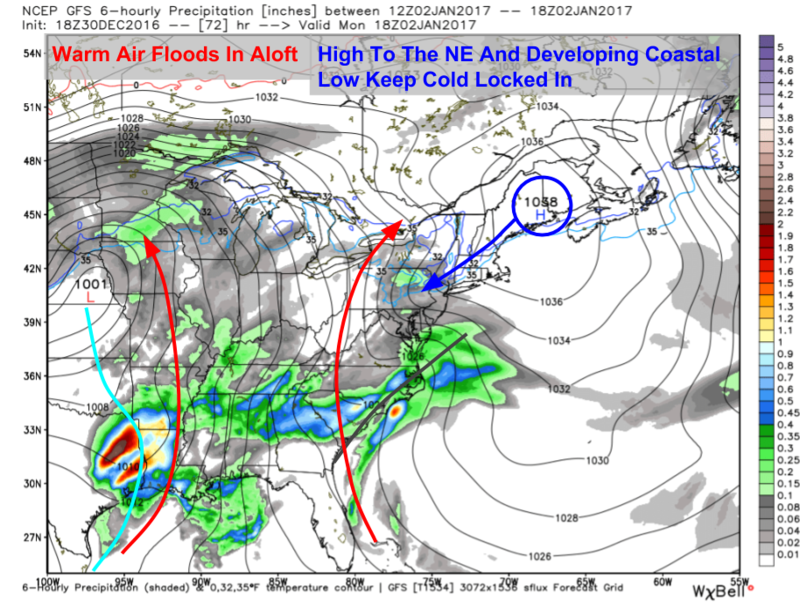 For big snows along the coast, we need a strong high to the N/NW to lock in the cold air and keep the cold air flooding south through the storm. This will not be the case tomorrow evening. As for the low pressure systems, the primary low was over MN this morning (it is now over SW Ontario) and the secondary low (our storm) was over northern OK (it is now over AR/SW OK). Snow will move into the area beginning in SW NH late tomorrow morning and ending up in the Augusta area by sundown. 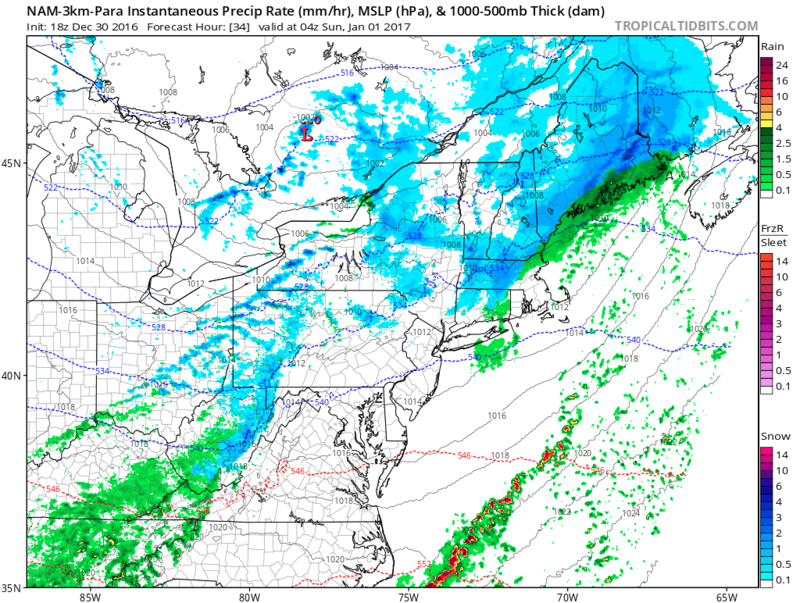 There are some indications precip will begin a little earlier in the Portland/Midcoast area as snow showers move in off the ocean but we’ll have to wait until mid afternoon for any more meaningful snowfall. 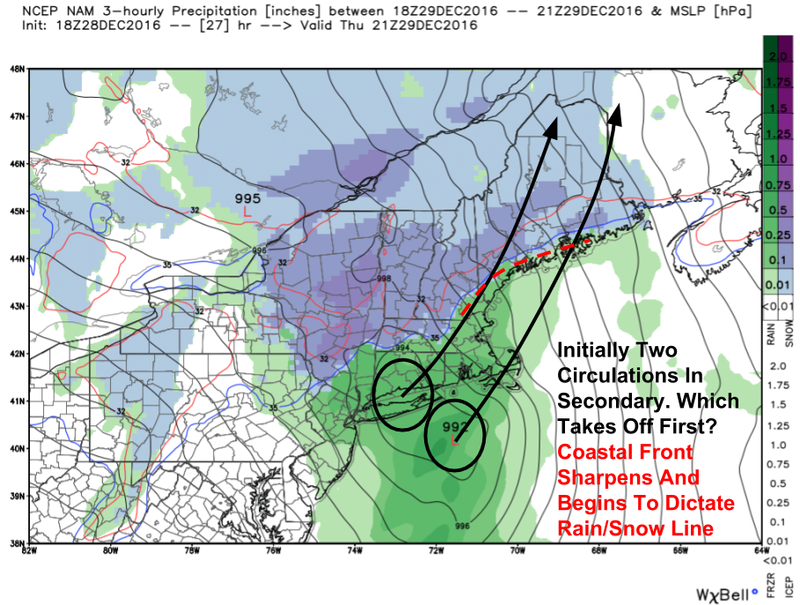 Precip will begin as a period of snow for most if not all areas but will quickly change to rain along the immediate coast (east/south of rt 1). By sundown tomorrow, a couple of inches will be on the ground over SW NH with dustings elsewhere. As the evening wears on, heavier bands of snow will begin to pivot into the area as coastal low pressure kicks into gear offshore. Guidance is hinting at two circulations being present initially. Which one becomes dominant will dictate which track the low takes and thus how much warm air can wrap into the coast. If the western circulation develops, the storm will track farther to the west and the coast will be warmer, warm enough perhaps for all rain. 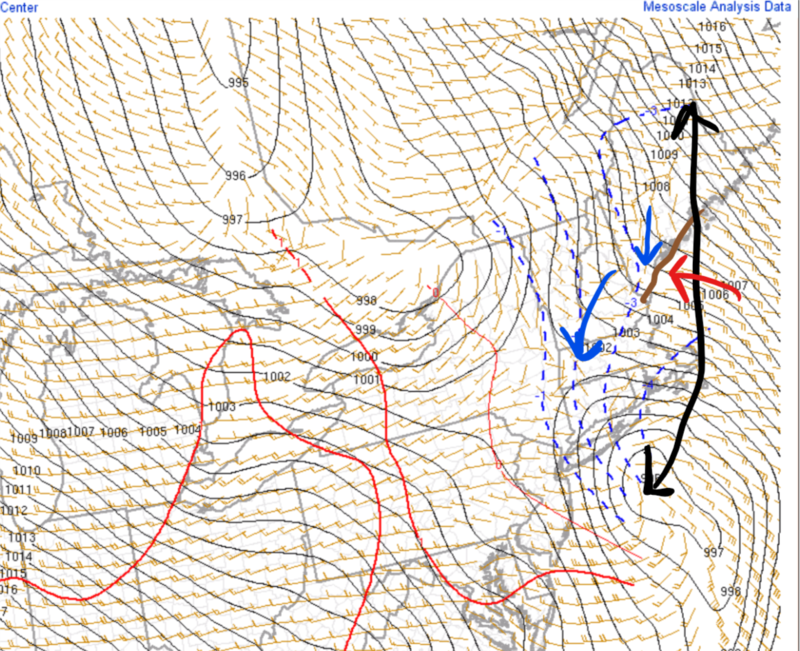 If the eastern circulation develops, the opposite would happen with the coast seeing slightly more snow. The difference here is not between 3 and 12″, it is rather between 0 and 3-6″. This is not a storm for the coast to see big snows but if the eastern track pans out, the coast would see moderate accumulations as opposed to light/nonexistent accumulations. Precip will begin to fall very heavily as powerful mid/upper level dynamics move into place Thursday night. At 500mb, it’s hard to imagine a better setup for rapid cyclogenesis. 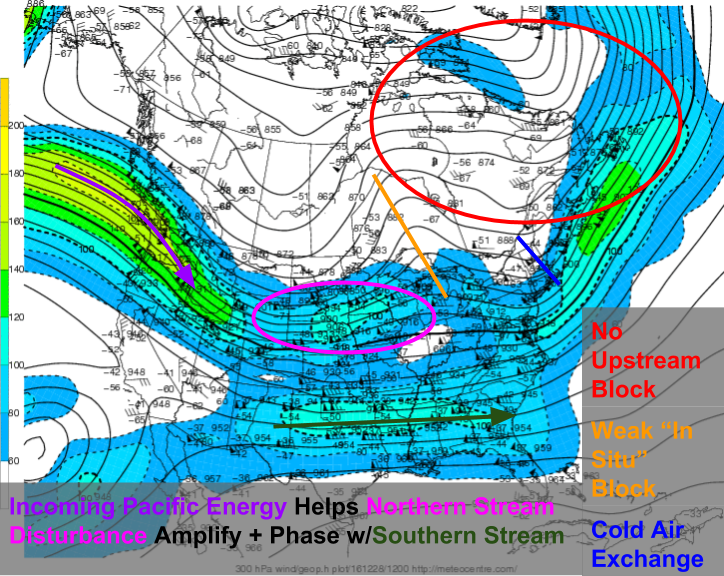 The shortwave trough is negatively tilted and a very strong vortmax is racing NNE out ahead of it. Winds ahead of both the vort and the trough are strongly divergent which favors intense upward motion across the entire area. 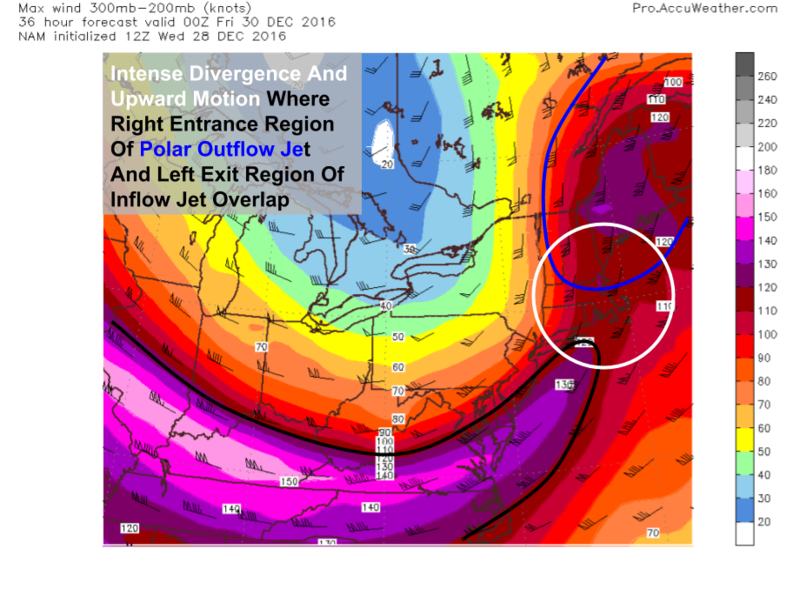 Another factor aiding in explosive cyclogenesis will be favorable jet dynamics in the upper levels of the atmosphere. The polar outflow jet of the storm is forecast to be situated in such a way that its right entrance region will overlap with the left exit region of the inflow jet to the south/south-west. This overlapping of zones favorable for divergence will allow the storm at the surface to rapidly strengthen, deepening around 20mb in 12 hours! What does all this divergence mean? Upward motion Thursday night will be truly incredible. 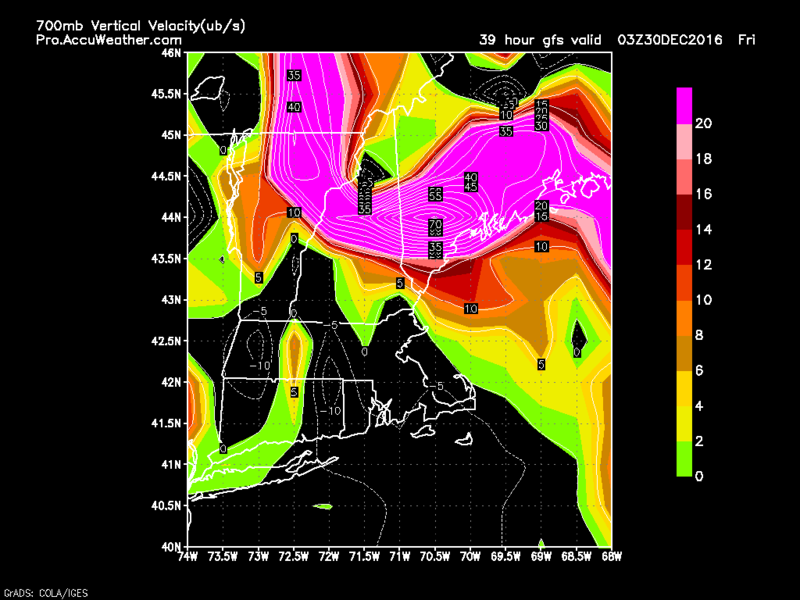 When the scale ends at 20 and values are forecast to exceed 70, you know the event is highly anomalous. The rapid deepening of the surface low, the intense vort at 500mb, and the jet dynamics at 300mb will combine to lift the air at a very high rate. What does this mean for us? Precip will be falling and it will be falling hard. A band of precip will set up Thursday evening across eastern NH and western ME that will feature whiteout snow falling at rates of 1-3″/hr+, torrential downpours along the coast, very strong winds, and possibly thunder. The fact that precip will be falling so heavily is important because of a phenomenon known as dynamic cooling. When there’s so much upward motion and so many snowflakes melting into raindrops, the atmosphere (especially the above freezing parts) will cool rapidly. This is the key to snowfall east of I-95 and N/W of the peninsulas. The next paragraph explains dynamic cooling and is borrowed from last evening’s update. As snowflakes melt, the water they contain goes from solid (frozen) form to liquid form. This phase change requires outside energy to energize the water molecules into moving around more, thus changing the phase from solid to liquid. Where does this energy come from? The air around the melting hydrometeors (a fancy word for water (hydro) that falls from the sky (meteor) ). What happens when you remove energy from the air? It cools because, by definition, air with less energy is colder. If you have tons and tons of snowflakes melting at the same time, the temperature will continue to cool and eventually, the entire column will cool below freezing and snow can reach the ground. This process is aided by the intense lifting as air rises, cools, and is replaced at the surface by colder air moving in from the NW. The problem along the coast is that the dynamic cooling has a lot of warm air to overcome. 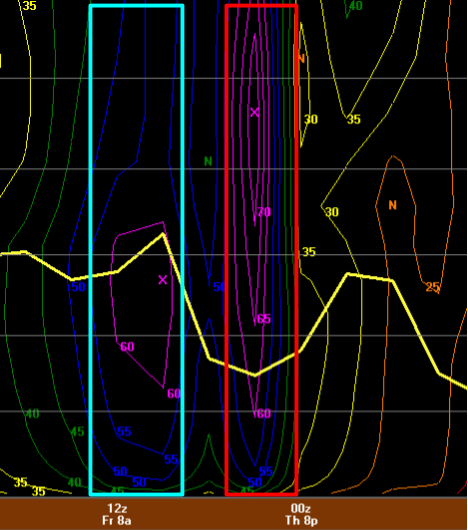 The warm layer in Portland is modeled to be around 5,000 feet deep by most guidance. Some models are colder but not by a lot. While melting and lifting will cool the atmosphere a bunch, it likely won’t be enough to get significant accumulations. The accumulating snow along the coast will come at the very end as cold air rushes in from the west while precip moves out. IF the easterly track pans out, the warm layer would be shallower and the dynamic cooling would have a chance at cooling the column enough for more substantial snows near the coast. As I mentioned above, there is a cap on snowfall potential east of I-95. I’d say this is about 6″ which would only fall in this area if a) the storm tracked a little east, b) the dynamic cooling worked out as strong or stronger than forecast and c) moisture aloft continued to keep snow falling longer as cold air rushed in behind the storm Friday morning. If none of that happens, most coastal areas would only see an inch or two at best and parts of the midcoast could see no snow at all. Besides the heavy precip, the other big story with this storm will be the wind. There will be two rounds of very strong winds, one on the front side of the storm and one on the back side. On the front side, winds will be out of the ESE along the coast with gusts to 60mph possible along the midcoast. Gusts to 50-55 mph are likely in the Portland area and points along the coast SW of that. On the back side, winds will flip to the west and begin blasting at similar speeds. While the front side winds will be mostly a coastal issue, the westerlies on the back side will impact everyone. Here’s another visualization of the winds at a single point (Rockland) through time. Much like a hurricane, there will be front side winds, a calm period as the center of the storm passes overhead, and then back side winds. 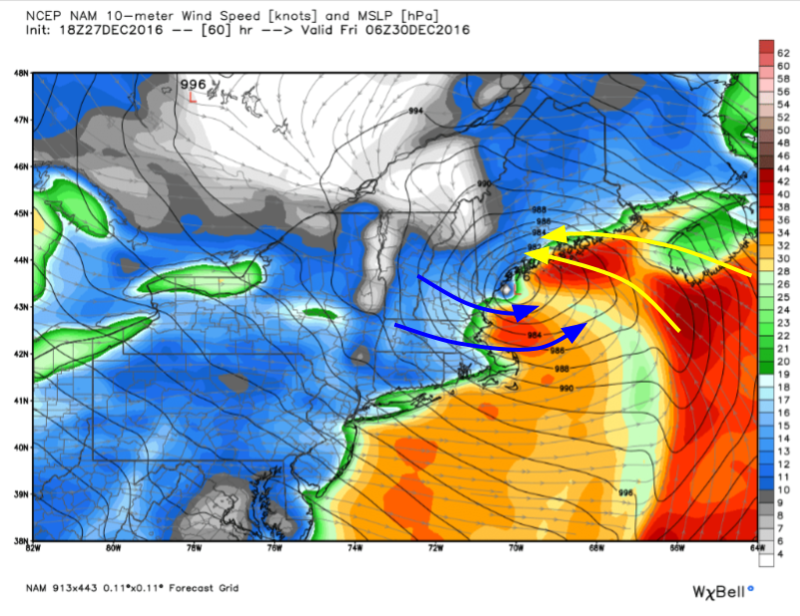 Winds will not be of hurricane strength though a gust to hurricane force can’t be ruled out offshore and possibly at an exposed Midcoast point. These winds will definitely be strong enough to knock down trees and power lines especially those anchored in soggy ground (midcoast) or those weighed down by heavy snow (inland). With colder air moving in behind this storm, it will be important to be prepared for a night or two in the cold should your power go out. 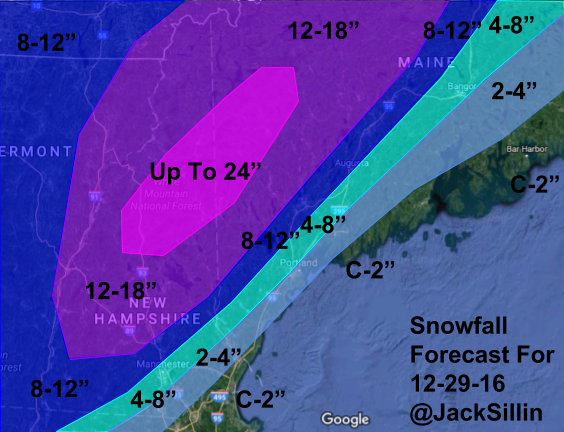 Here’s the latest snowfall forecast. The main adjustment was to trim back totals a bit near the coast as guidance has shifted towards a warmer solution. The bullseye of around 2 feet in the Whites/Mahoosics still looks good. The area with the sharpest gradient (near the coast) still has a bit of uncertainty attached as some guidance still wants to hang onto a colder solution. This will be watched and any adjustments needed made tomorrow. To summarize: snow will arrive from SW to NE midday tomorrow and will change to rain along the coast tomorrow evening. Heavy snow and rain will arrive tomorrow evening and last through tomorrow night with whiteouts possible in areas of heavy snow. Thunder will also be possible as dry air moves in aloft and instability is created with warmer and moister air near the surface. Winds will be strongest along the coast and will blast the area in two parts. The first will be along the coast with ESE winds gusting up to 60mph. The second will be enjoyed by everyone with WNW winds gusting up to 50mph. These winds will be strong enough for power outage concerns. No coastal flooding concerns are expected as tides are astronomically low though a few instances of minor splashover are possible along the midcoast where onshore flow will be strongest. The pattern doesn’t stop here, more snow is in the forecast for New Year’s Eve night and mixed precipitation may threaten to begin the first week of 2017. I will have an update on those storm threats later this evening or tomorrow. Today will feature a mix of sun and clouds along with NW breezes and the chance for flurries. Look for highs topping out between 25 in the north and 32 in the south as NW breezes bring cooler air into the region. A weak disturbance will float by overhead today and will result in a few flurries here and there. No accumulation is expected. The more interesting weather arrives tomorrow with heavy snow, rain, and wind by tomorrow night. For all the details on that, check out last night’s update. I will have more this evening.